Formerly known as the High Sierra Primitive Area, this wildland is steep and rugged, with high ridges standing above deep canyons. Elevations range from about 2,000 feet on the banks of the South Fork of the Kings River to 11,077 feet on Hogback Peak. Brush and oak woodlands cover the lower elevations, giving way to pine and red fir, and, finally, giant sequoias in the higher country. The ragged, brushy terrain in the northwest portion (in Sierra National Forest) has no trails, and travel is extremely difficult. Trails in the rest of the area (in Sequoia National Forest) are mostly steep and strenuous. The Deer Cove Trail from Highway 180 rises 3,000 feet in four miles. Two loop trails provide access into the northern portion, and trails lead from this region into Kings Canyon National Park. Only two trails lead into the southern portion: the Deer Meadow Trail (four miles) and the Kanawyer Trail (seven miles) from Cedar Grove Campground. Sheer ruggedness has kept human use light despite the fact that State Highway 180 splits the area in half. 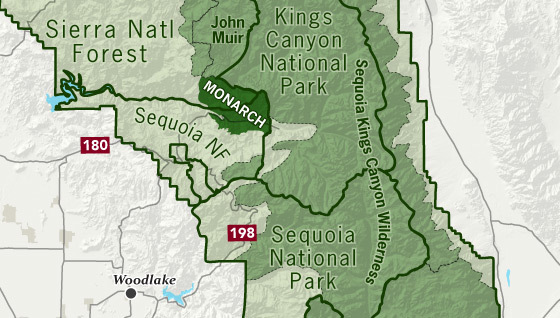 The Monarch Wilderness is managed by the Sierra and Sequoia National Forests. If you enter the wilderness from the south through Sequoia National Forest no wilderness permit is required. If you begin your trip on the northern side of the wilderness in Sierra National Forest, however, a wilderness permit is required. Use the links in the sidebar to access the Sierra NF site. No more than 15 people and 25 head of stock are allowed on overnight trips. Why? Campfires are allowed with a fire permit. In places where fires are allowed, make sure to always use smart campfire methods. Proper food storage is required at all times. Bear canisters are recommended. The counter-balance method can also be effective if done properly. Use the bear section on this site to learn more about how to protect your food and the Sierra’s black bears. Pets must be on a leash or under voice control at all times. Offering some of the most isolated and rugged terrain in the Sierra, the Monarch Wilderness lives up to its regal name.